Tomorrow is Thanksgiving Day. I had intended to publish this recipe for pumpkin dinner rolls last weekend so that people would still have time to incorporate it into their meal plans if they wanted to... 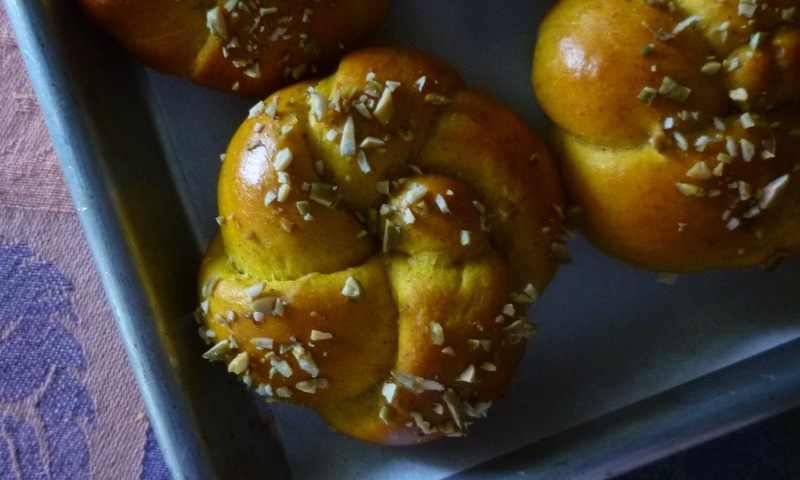 But my internet has been down.... Fortunately—thanks to my nephew—it is back up now, and for those who might like to try these rolls for the big meal, there is still just enough time to squeeze them in. So... I thought I would go ahead and share this special recipe anyway...before this season of pumpkin spice...and all things pumpkin...is entirely past. 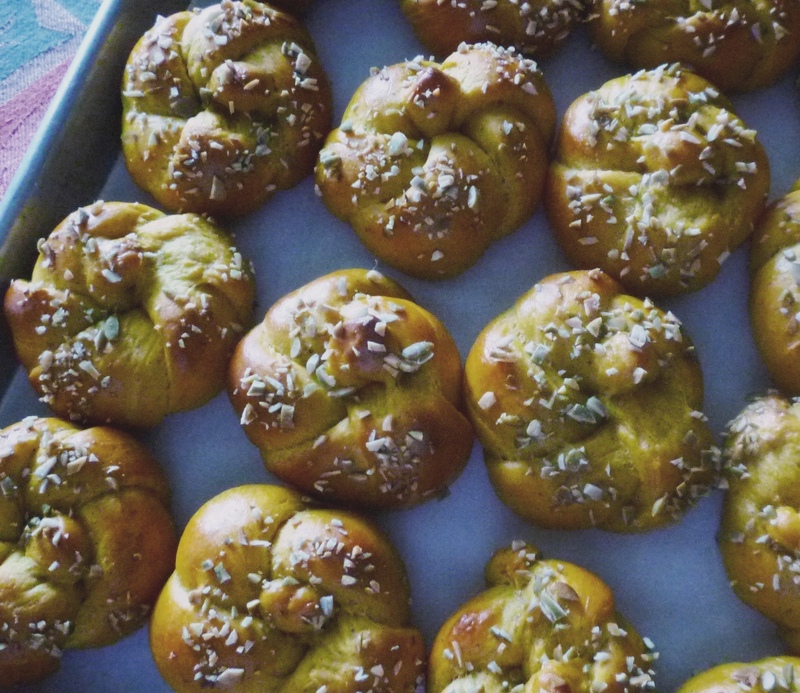 I got the idea for these rolls from a recipe for a pumpkin-shaped, pumpkin-flavored, artisanal boule in The Big Sur Bakery Cookbook. 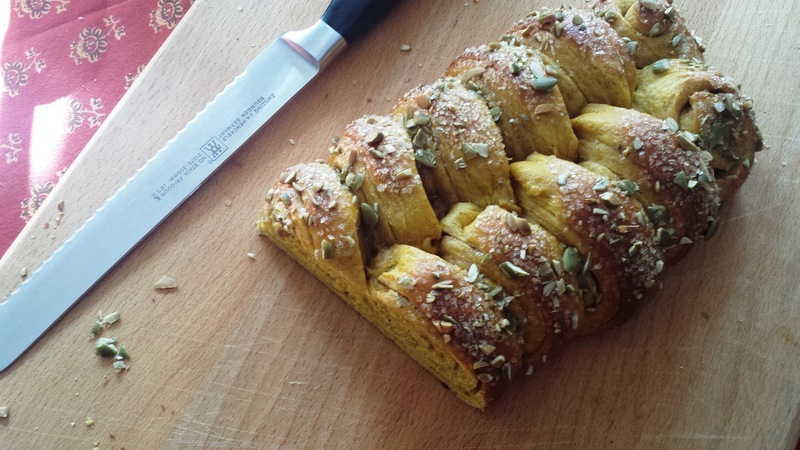 I'm sure the recipe that inspired me produced a delicious and beautiful bread, but I admit I never tried it. As I looked at the recipe...and thought about serving it...I could only think what a shame it would be that once it was sliced no one would know how beautiful it had been to begin with. 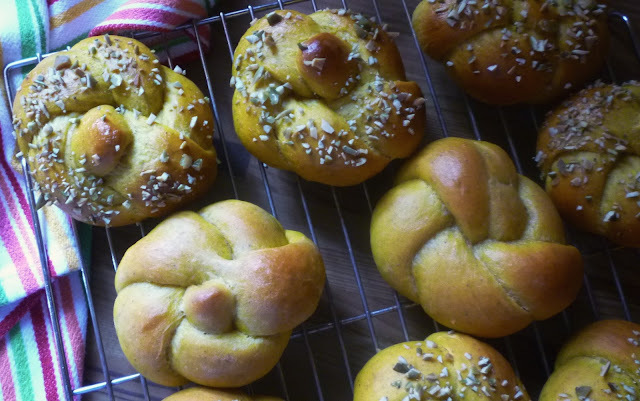 I thought it would be much more fun to be able to give each person their own little pumpkin shaped bread. The rolls I ended up making are soft and slightly sweet...very much in the tradition of the Parker House or Crescent Rolls that show up on tables all across the U.S. during the holiday season. To make them, I converted my friend Bonnie's cardamom bread dough to a pumpkin dough. I replaced all of the liquids with pumpkin (which is about 90% water) and followed the lead of the Big Sur Bakery recipe by switching to brown sugar and adding loads of the spices we have come to associate with pumpkin (cinnamon, ginger, allspice and nutmeg...). After checking with Bonnie to see if she thought her recipe could support more butter, I increased the butter to add richness and tenderness. The final recipe is almost a hybrid of a traditional American dinner roll dough and a simple Brioche dough. In fact, if you have ever made brioche, you will recognize that my method for adding the butter (whole, as opposed to melted—and after all of the other ingredients have been added) is similar to brioche. 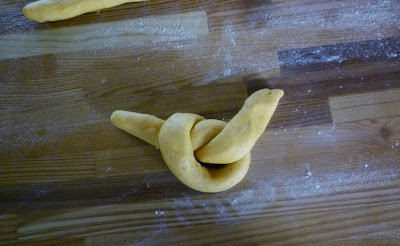 I have never tried to make this dough by hand...it really does best in a mixer fitted with the dough hook. 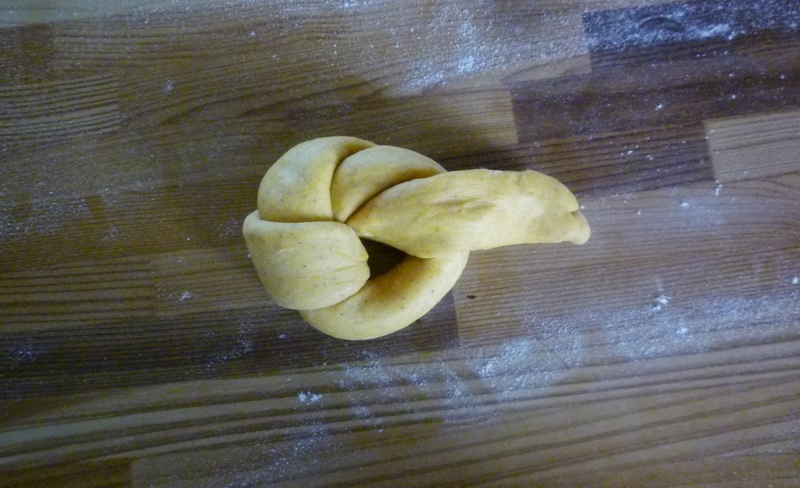 Because of the nature of the pumpkin, at first the dough will seem unmanageably dry....then suddenly, very wet. Also, the development of the gluten seems to take a bit longer than usual. I'm not a bread expert, but I would guess this is due to the fibrous nature of the pumpkin (not to mention the larger quantity of butter) inhibiting the formation of gluten strands. As the dough mixes, stop as often as is necessary during the first stages of mixing to scrape down the sides and encourage the dough to come together around the hook.... And be patient—eventually it really will come together into a smooth and supple mass. 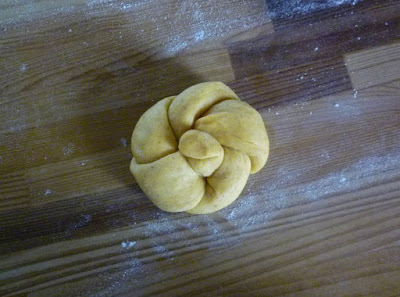 I have structured the recipe so that the dough is made the day before the rolls are to be baked and served. I find this schedule works much better for holiday meals (not to mention how much more developed the flavor is after an overnight rise in the fridge). But you can work even further ahead by making the rolls and freezing them. To thaw them, let them sit on the counter in their air tight wrapping for an hour or so, then transfer them to a baking sheet and cover them with foil for a brief warm up in a moderate oven. 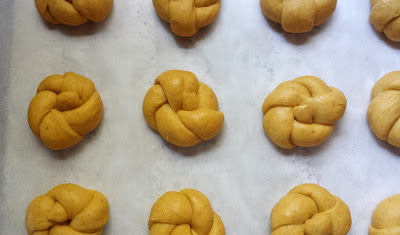 You can of course form these rolls into any shape you like....a plain round roll...or a clover leaf...or a crescent roll...etc. But I find the pumpkin shape (basically formed like a Kaiser roll) to be utterly charming. I think that the little bit of extra time it takes to form them is totally worth it for a special holiday meal. 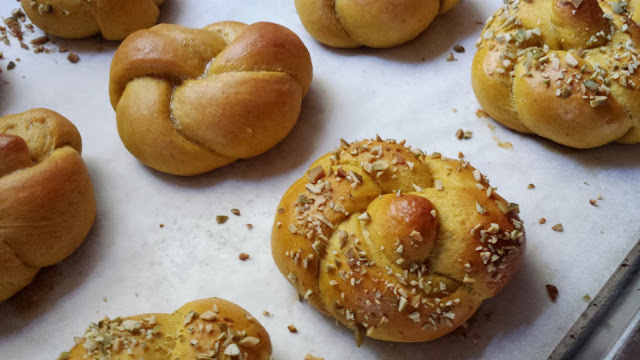 Finally, as with any basic, slightly sweet soft roll dough, this dough can be formed into all kinds of beautiful loaves and filled buns. You could make a tea ring (filled with butter, brown sugar, pecans and spices)...or a twisted loaf (similar to my St. Augustine braid)...or cinnamon rolls or sticky buns. So far, my favorite alternate form is the beautiful coiled and swirled loaf that Bonnie often makes with her cardamom dough. 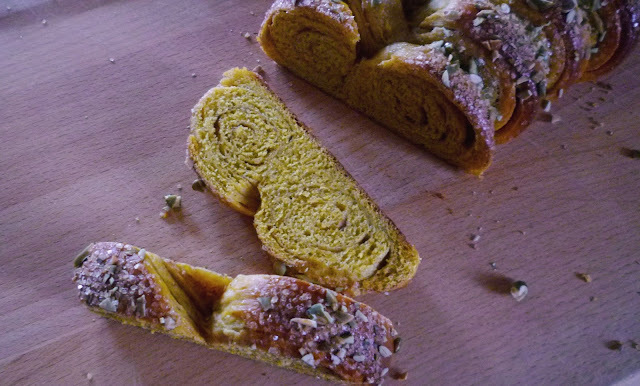 I have included the instructions for forming this loaf at the end of the recipe... That way, even if you have another dinner roll recipe that you will be making for your Thanksgiving dinner, you can still make this delicious pumpkin bread to serve as part of one of your holiday weekend breakfast spreads. Place 1 cup (114 g.) of the flour in a small bowl. Add the spices and whisk to combine. Set aside. Place the water in the bowl of a stand mixer. Sprinkle the yeast over the water. If using active dry yeast, let it sit for a minute or two to soften. Add the egg, pumpkin, 3 c. (340 g.) of the flour, salt and sugar (in that order). Using the dough hook mix on low speed (no. 2 to 3) until the ingredients are homogenous (2 to 3 minutes). Add the flour/spices mixture and continue to mix until absorbed (another 2 to 3 minutes). 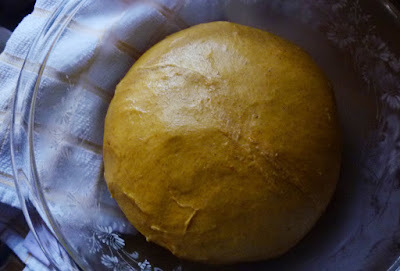 Scrape the dough into a buttered bowl and turn to coat. Cover the bowl with plastic wrap and let rest at room temperature for an hour to an hour and a half. The dough will begin to rise, but it may or may not double during this time. Deflate and place in the refrigerator overnight (for 8 to 24 hours). Remove the dough from the refrigerator and portion into 24 equal pieces (41 g./1 1/2 oz. each). Working with 6 pieces at a time, roll each piece out into a 10 to 12 inch rope, using only enough flour to keep the dough from being unmanageably sticky. and then the one from the other side: down, under and up through the center (this second one will form the pumpkin's "stem"). Place the formed rolls on two parchment-lined baking sheets and cover loosely with plastic wrap. 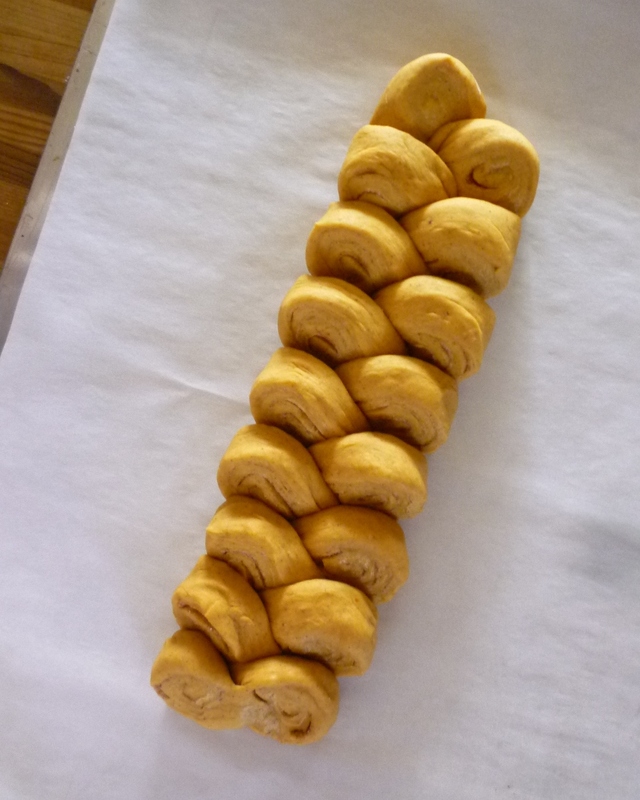 Let rise until doubled in size—about 1 1/4 hours (the rolls are fully risen when an indentation remains when a roll is gently prodded with your finger). 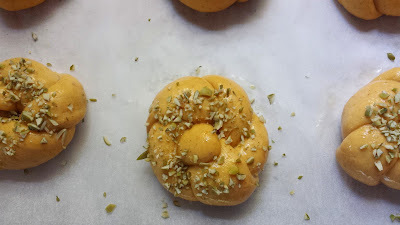 Carefully brush the rolls with egg wash and sprinkle with the minced pepitas. Bake in a preheated 365° oven until golden brown and cooked through—about 15 minutes. Let cool on a wire rack. Serve warm. Makes 2 dozen rolls. If you prefer you may replace all of the spices with 1 T. of pumpkin pie spice. This dough may be used to make any shape dinner roll as well as cinnamon rolls, sticky buns, braided loaves and tea rings. On a lightly floured surface, roll the dough out into a thin 12- by 16-inch rectangle, making sure that the long side runs parallel to the edge of the work surface in front of you. 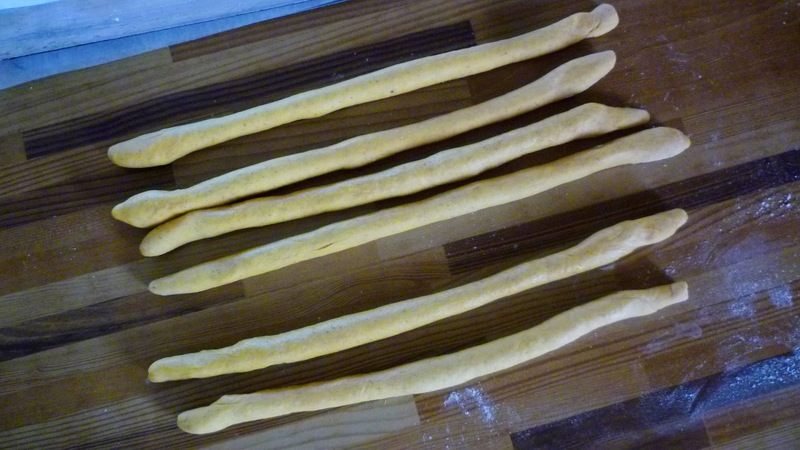 Brush the dough with the melted butter. 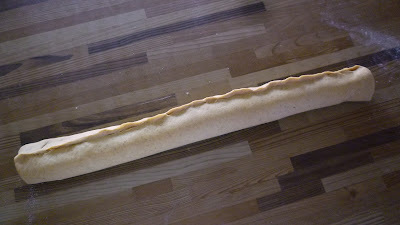 Scatter sugar/pumpkin pie spice evenly over the buttered dough, leaving a 1/2-inch strip of dough across the top bare. 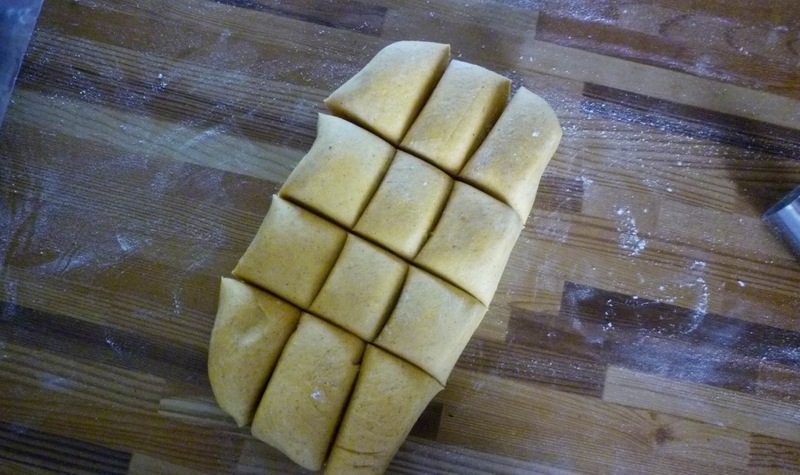 Starting with the edge nearest you, roll the dough up jellyroll-style. Pinch the final seam into the dough to seal. Using a sharp knife, kitchen scissors or a bench scraper, cut the roll deeply—but not all the way through—at 1-inch intervals. Rotate the roll so that the original pinched seam is down. 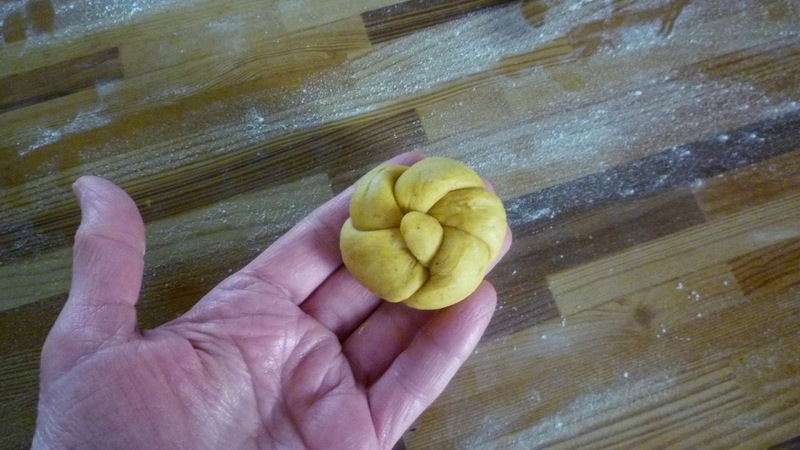 Twist the cut segments/rolls in alternating directions. 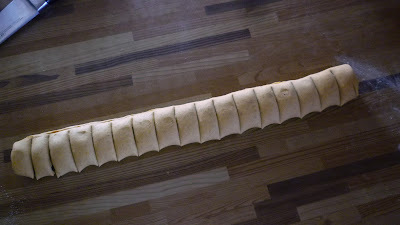 Shorten the loaf a bit by scrunching it together so that the segments are shingled slightly and the entire loaf is closer to 10 to 12 inches in length (rather than the original 16 inches). Transfer to a parchment-lined baking sheet and cover loosely with plastic wrap. Let rise in a warm place until doubled in bulk (about an hour and 15 minutes). 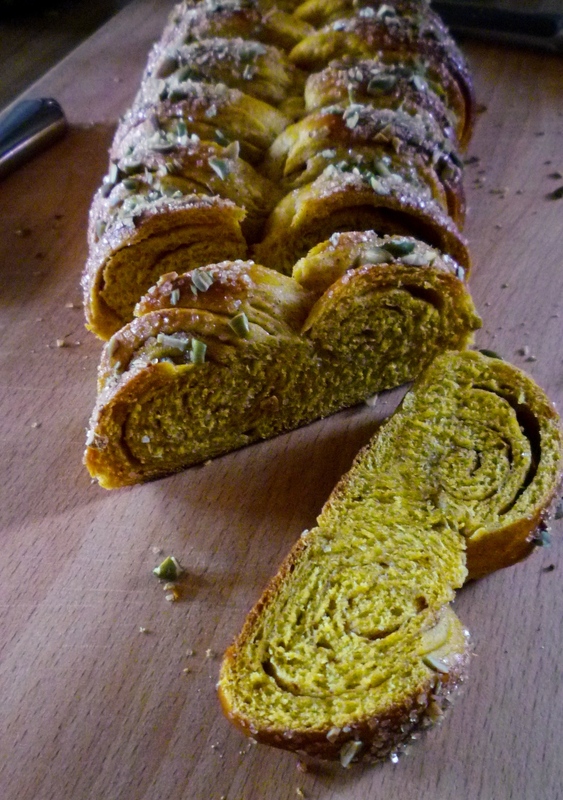 Carefully brush with egg wash and scatter the pumpkin seeds and sugar generously over all. Bake the loaf in a 365° until puffed and golden brown—about 20 to 25 minutes. 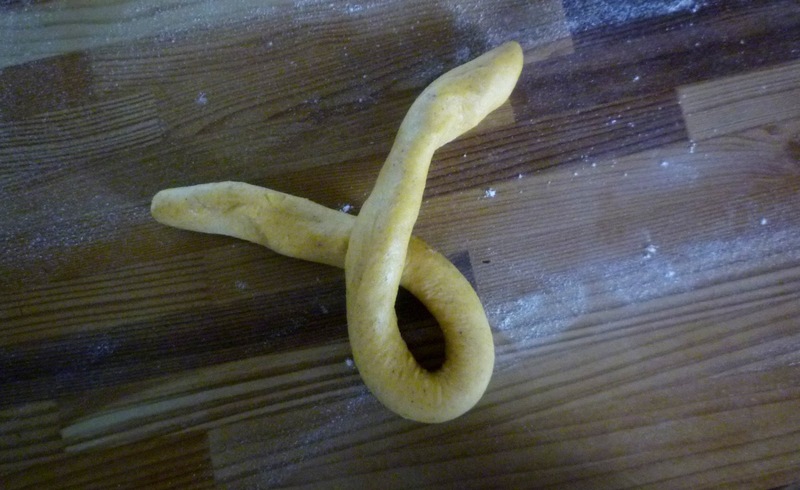 Remove from the oven and slide onto a wire rack. Let cool briefly before slicing. Serves 10 to 12. Thank you Katrina! and Happy Thanksgiving to you too! I'm so happy you have found a flour that you can use...I'll bet your pies (and everything else on your table) will be delicious!